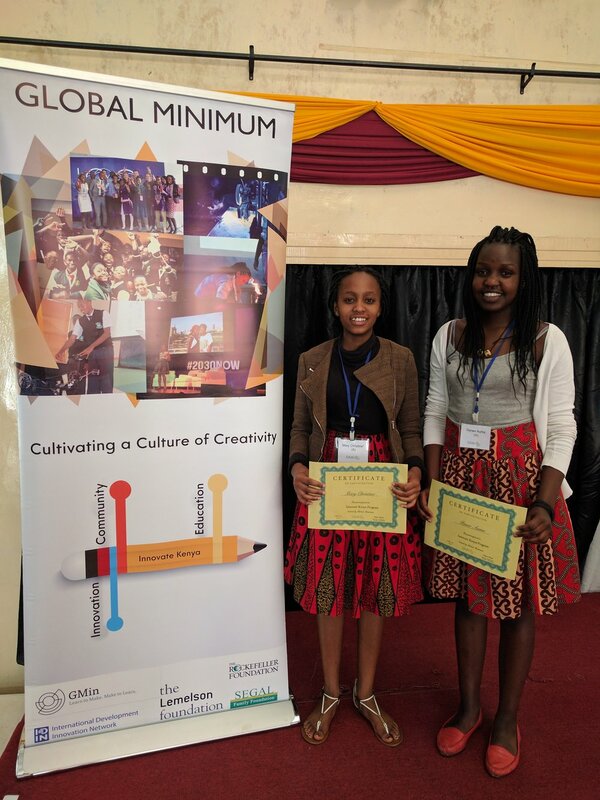 From April 9th-15th 2017, Global Minimum (GMin) hosted a 1-week innovation camp for Kenyan youth who have come up with solutions for issues affecting their communities. These solutions address unique problems to Kenya including agriculture, education, health, information technology, waste management, energy and infrastructure. The top 12 projects countrywide were selected for the challenge. Through the camp, youth went through series of design-thinking trainings, leadership clinics, community outings, and most importantly, rigorous technical training and exploration in their area of interest. Participants from the first Mekatilili Workshop, Tamara Cheruiyot, 17, Michelle Kibias, 17, and Tracy Muthoni, 17, that was held in Loreto Convent Msongari were selected to be part of the camp. Their solution, Organo Power, utilizes organic waste to generate electricity by designing a battery made out of organic wastes. On a larger scale, the group is looking to target informal settlements with their project, which will help in reducing pollution and also providing waste management solutions in the target areas. Furthermore, it will improve community development and provide employment opportunities for young people. 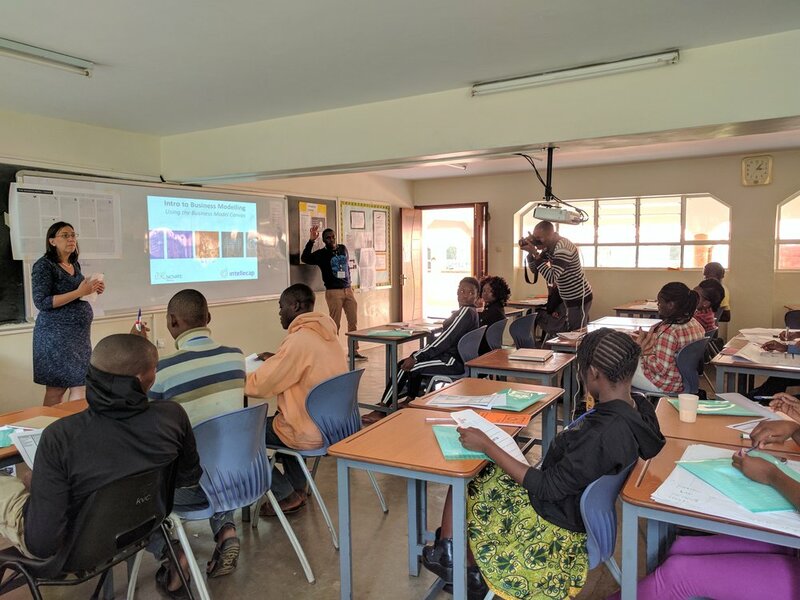 Marian Muthui, founder of the Mekatilili Program, was invited to mentor some of the participating teams that included Medbit Inc, which is an ICT solution that seeks to reduce mortality rates in East Africa by providing reliable information about medical facilities, their locations and services offered. Medbit Inc will provide a platform for patients access healthcare facilities when needed including emergency services. Additionally, Medbit will have a database with information on drugs previously accessible to chemists and pharmacists. The information is provided by professions in healthcare and legitimate medical facilities ensuring accuracy and reliability. Medbit was developed by Mary Christine, 15 and Renee Auma, 16, from Loreto Convent Valley Road. Skypod is a futuristic transport solution that seeks to reduce road accidents and traffic by creating a rapid and efficient transit system which will comprise of pods and rails. The team is hoping to use the electro-magnetism concept to provide a hovering effect to propel the pods forward. The system will be controlled by computers and is intended for country wide implementation. This project seeks to solve the problem of environmental pollution by recycling plastic bottles, spoons, cups and wine bottles to manufacture beautiful and affordable chandeliers for homes. The end product is long lasting since the material is non-biodegradable. This team has seen how much dumping of egg shells contributes to environmental pollution in Kawangware. The Deco tiles project is working towards creating a clean and safe environment by using egg shells to make affordable decorative tiles. Decorative Tiles will also provide employment opportunities for young people. Despite the existing CCTV infrastructure, people still face insecurity challenges whether in their homes and on the roads. The Modified CCTV will help save lives by monitoring inside vehicles. With the control of a servo motor, the CCTV cameras will rotate through 360 degrees capturing a 3D view of objects and people. The team hopes to collaborate with security companies and vehicle manufacturers to achieve their goal. electricity. This over dependence leads to unexpected blackouts and unreliable supply of power. Energy Revolution project intends to provide alternative sources of power by establishing an industry that will produce electricity using both wind and solar energy. The project will utilize the increasing number of plastic waste and produce valuable products such as building blocks and posts that are strong and can endure termites. Using plastic waste will provide an alternative for wood thus reducing deforestation. The project will also provide employment for young people through plastic waste collection. Generating electricity to meet the high demand in the market is expensive. E-Gen is a device that utilizes electromagnetic induction, programming and other engineering principles to generate electricity for households. The innovative solution seeks to reduce environmental pollution by providing clean energy solutions for consumers. The range extender seeks to increase the recharge time for electric machinery and cars while minimizing air pollution. By adding a small generator to the driveshaft of an electric car, the power drawn from the batteries will be boosted thus increasing the range of the vehicle. The solution will reduce the cost of running electric machines including cars, ships and diesel-electric trains. BluwDrive is a Universal Serial Bus that will use bluetooth technology to aid safe storage and transfer of personal data through an application software designed for a range of hardware. The device is cross functional as there exist numerous bluetooth enabled devices to interface. Moreover, BluwDrive offers data security for the user. Some of the features the user gets to enjoy are streaming music and videos from your device, organizing documents and synchronizing them for offline access and editing pictures. i-Sight will help visually impaired people including children and students. The special glasses will use real time processing to enable blind people perform basic tasks such as crossing the road, shopping, getting a taxi. The gadget also allows the user to call for help by using a distress button.